This is a package deal for Ten 1.35 LB SOFT SHELL LOBSTERS COOKED. Still available this Fall. Soft Shell lobsters are absolutely sweet and succulent. The meat quality is a tender. 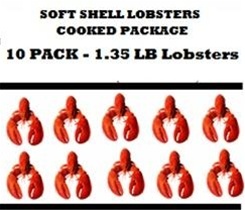 A great price for those who know the taste of a "melt in your mouth" lobster meat quality. These lobsters are sold COOKED ONLY, not live.